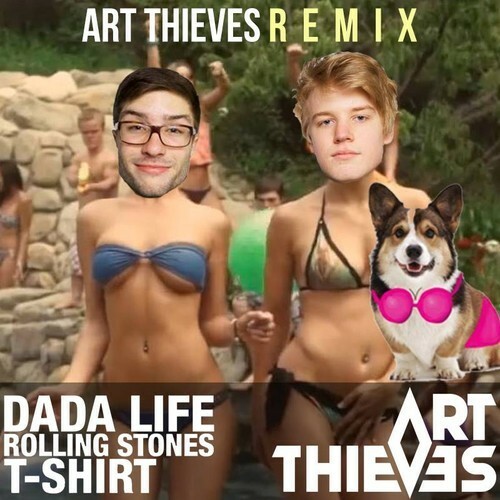 Art Thieves consist are two producers from Burlington, VT who produce electro-house and progressive house. I discovered Art Thieves a few weeks ago when I stumbled across their remix of ‘Time to Pretend’ by MGMT. I immediately fell in love with the remix, and I’ve been listening to their remix of ‘Time To Pretend’ constantly in the past few weeks. Since then I’ve been a fan of the duo, and I was ecstatic to see that they released a remix of ‘Rolling Stones T-Shirt’ by Dada Life. A month ago they created and released their remix of ‘Kick Out the Epic Motherf*cker’ by Dada Life which I really liked. Before listening to their remix of ‘Rolling Stones T-Shirt’ for the first time, I was hoping this Dada Life remix would be just as good as their last one. It turns out I loved this Dada Life remix much more than their previous one! They absolutely killed their remix of ‘Rolling Stones T-Shirt,’ and I’ve been listening to it non-stop. Art Thieves always manage to produce and create beautiful melodies, and I think their melodies is what makes me love them so much. Their melody in this remix is superb, and everything in the track fits perfectly. They seriously know how to create fantastic melodies, and when you can do that your remixes will turn out fantastic as well. There’s no doubt in my mind that I already prefer the Art Thieve’s remix of ‘Rolling Stones T-Shirt’ to the original by Dada Life. I’ve always liked the original by Dada Life, but the Art Thieves just make the track more exciting and give it a better beat and overall sound. I don’t know how the Art Thieves aren’t more popular, but if they keep producing amazing remixes then they will surely gain attention and popularity quick. The duo is one of my favorite up and coming electro-house artists, and they have a ton boatload of potential and talent. I’m excited to see where they will go in the near future, and I can’t wait to hear what they have in store for us next! For now though make sure to listen to their epic remix of ‘Rolling Stones T-Shirt’ because chances are you will love it as much as I do. Plus, the Art Thieves are awesome enough to give it away as a free download, and I highly encourage everyone to download it and play it everywhere. Enjoy!